The Norfolk and Norwich University Hospitals NHS Foundation Trust is committed to supporting people with learning disabilities and/or autism who access our healthcare services. 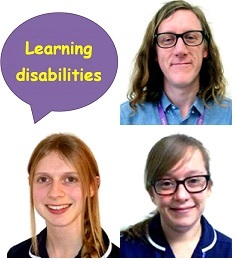 The Trust has a small team of Acute Liaison Nurses whose role is to make sure patients’ with learning disabilities and/or autism stay in hospital is as good as possible. They also talk to other hospital staff about patients with learning disabilities and/or autism and provide training.